According to recent research carried out by City & Guilds, 87% of employers struggle to recruit staff who have the skills they need and, of these, 38% highlight management roles as the hardest to fill. So what skills are missing? And what can you do about it? Results from a global survey carried out by LinkedIn sheds some light on these important questions. LinkedIn surveyed approximately 4,000 professionals from North America, Europe, and Asia between July 2017 and September 2017. The number one training priority identified in the survey for talent development in 2018 was soft skills training. 89% of executives said it was difficult to find people with the right soft skills (a slightly higher figure than the City and Guilds statistics), and a massive 92% said that soft skills were equally important or more important than technical skills. So which soft skills are deemed important? The survey revealed that the top 3 skills that executives wanted to develop in their employees were leadership skills, communication skills, and collaboration or team working skills. It seems that as technology accelerates, these soft skills are in ever greater demand to fuel business growth. This conclusion is supported by Jake Tween, Head of Apprenticeships at ILM, who reported that the UK has a large and growing leadership and management skills gap that contributes to poor productivity. He also commented that managers and leaders are amongst the least likely to receive formal training and development. Perhaps this is why the LinkedIn survey also showed that 35% of executives expected to increase their L&D budget in 2018, with the majority of this allocated specifically to soft skills development programs. So how should this increased budget be spent to achieve the best ROI? 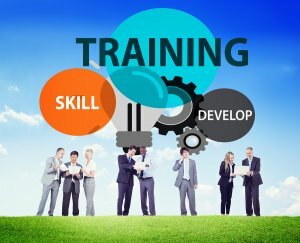 What training methods work best to develop soft skills? There is a trend to employ e-learning rather than traditional classroom based training to deliver L&D solutions. E-learning has the reputation of being more convenient and cost-effective than classroom training, but is it as effective when it comes to learning “stickiness” and changing behaviour? Some topics certainly do lend themselves more naturally to comprehension and “stickiness” in an e-learning format, such as compliance-based courses or software and technical skill-building courses. These courses are often video-based, allowing employees to pause the course at any point to apply the lesson on their own computer. The development of soft skills is different. It benefits from the interaction you can only achieve in a face-to-face situation, where learners can discuss, collaborate, solve problems, role-play and receive individual help, feedback and guidance from a live tutor. In other words practice the very soft skills the training is designed to develop. No amount of watching a video, or reading a script can substitute for this. If you want help in developing the soft skills of your employees, please use the enquiry form to get in touch.